Major General William C. Groeniger III, served in the military for 37 years. He enlisted in the California Air National Guard in 1951 and transferred to the Marine Corps Reserve as an officer candidate upon graduating from college. His tour of duty included Korea in the 1950’s. 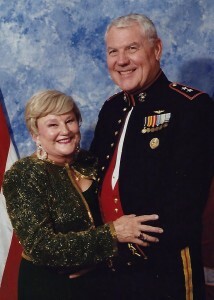 After being released from active duty in 1956, he continued serving in the Marine Reserves including the 4th Marine Aircraft Wing as the Commanding Officer, Assistant Division Commander, 4th Marines Division, , Commanding General of the Marine Corps Air Ground Combat Center. He also served as a member of the Reserve Forces Policy Board, and was Chairman, Secretary of the Navy’s Marine Corps Reserve Policy Board. His civilian occupation included being President and Chairman of Marden Susco, Inc. a significant entity in the distribution of products for the water, sewer, and fire protection in industrial markets. His community activities include Rotary, Boy Scouts Council, Chairman of the Board of Trustees, Marine Toys for Tots Foundation for 12 years and Director, Marine Corps University Foundation for 15 years. He was married to the late Nancy Groeniger who he met at a SAE sorority exchange at Cal. He is the father of five children, William, Scott, Kurt, Kristen and Brett.